GoaSave is an adware program that is advertised as an extension that will alert you about the weather. Adware developers oftentimes mask their products as seemingly useful add-ons so that users would download and install them. After all, by exposing you to advertisements, adware generates profit. Adware can also spread via software bundles and you need to pay extra close attention when installing freeware because that is where adware is usually hiding. It should be noted that adware is not malicious and does not aim to harm your computer but that does not mean you should allow it to stay. It could expose you to a malicious advertisements and you might end with a serious infection on your computer. We strongly suggest you remove GoaSave from the system before it can bring about trouble. You either downloaded GoaSave yourself, thinking it’s a useful add-on or it entered your computer via software bundles. It could have been attached to free software in a way that would allow it to install alongside the software. When you install free software, always use Advanced or Custom settings because only there will you be able to see if anything has been attached. If there is something, uncheck all the boxes next to the bundled items and you can proceed to install the software. Do not rush the installation processes because you will end up with all kinds of unwanted program and will have to uninstall GoaSave or similar again. GoaSave will send weather alerts to your desktop but it will also generate huge amounts of advertisements. Once you start seeing an increase in ads you might think switching to another browser would solve the problem but the adware affects all browsers, including Internet Explorer, Google Chrome and Mozilla Firefox. The only way you will be able to get rid of the adverts is if you delete GoaSave from the system. You will encounter all kinds of advertisements, from banners to pop-ups. 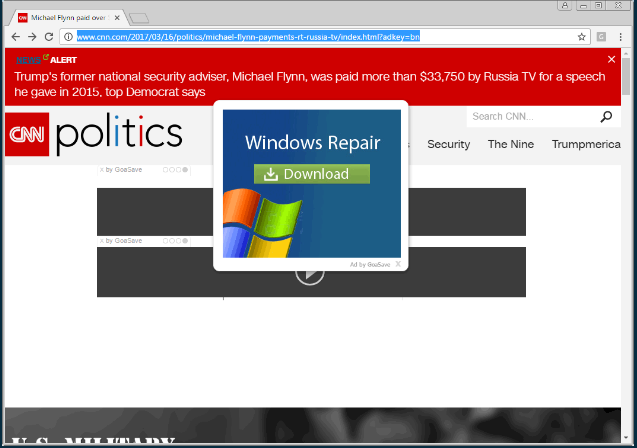 We do not suggest clicking on any of the ads while adware is present on your computer. Adware aims to generate income by leading you to ads but it does not make sure they are safe. You could be exposed to malicious sites where malware could lurking. After a while, you might also notice that the ads have become more personalized and advertise something you might be interested in. That is because the ad-supported software is tracking your browsing activities and gathering information about your interests. The more appealing to you the ad is, the more likely you are to press on it. If you do not want to end up with dangerous malware, you should remove GoaSave at once. There are two ways to uninstall GoaSave, manually and automatically. If you opt for automatic GoaSave removal, you will need to obtain some kind of professional removal software. The program would delete GoaSave and you would not need to do anything. If you try to erase GoaSave manually, you would need to locate the adware yourself.